Explore the Mystical Mainland of Southeast Asia – The Myanmar. 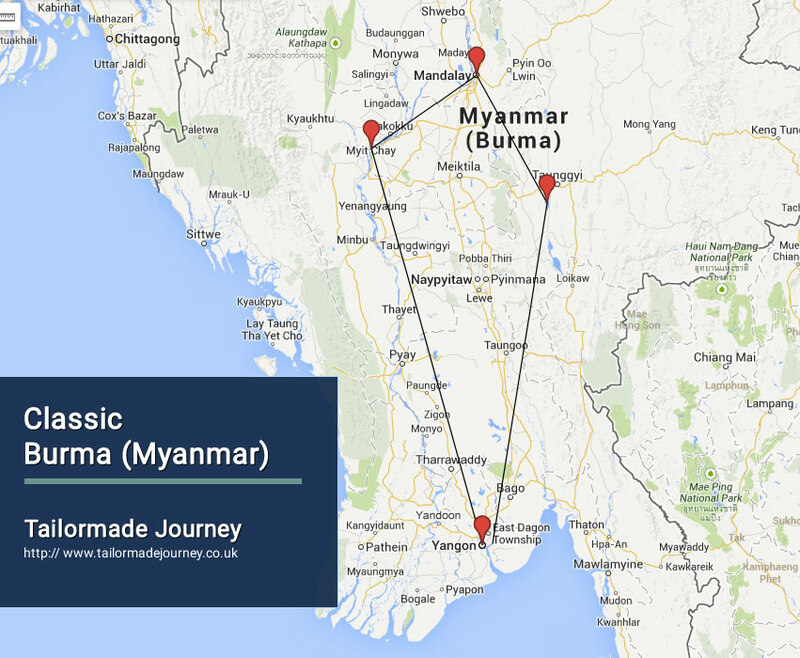 This tour takes you to Yangon the Former Capital of Myanmar, the ancient temple of Bagan, and the lake of Inle. Arrive Yangon ( Rangoon ) 2 Nights > Drive Bagan 2 Nights ( Excursion Mt Popa) > Drive Mandalay 2 Nights > Flight & Drive Inle Lake 2 Nights > Flight & Drive Yangon 1 Night & Leave. Upon arrival in Yangon International Airport you are met and transferred to your pre booked Hotel. Yangon has been the capital of Myanmar since the British transformed it into their administrative centre of future India. Its impressive colonial and spiritual heritage makes Yangon one of the most fascinating capitals of South East Asia. Breakfast at hotel and city tour in Yangon features: Karaweik royal barge, Chaukhtatgyi colossal reclining Buddha Image and Botataung Pagoda said to have enshrinement of Buddha hair relic. Walk around the harbor and a glance at historic Strand hotel and down town Yangon with central post office, custom house and high court to observe the colonial heritage in Yangon, Bogyoke market (closed on Monday), formally know as Scott Market, a sprawling 75 year old shopping complex noted for its variety of handicrafts and other items which provide an excellent opportunity for a shopping spree. Afternoon visit Shwedagon Pagoda “rising 326 feet, glittering with gold like sudden hope in the dark night of the soul” write by Somerset Maugham in his Gentlemen in the parlor certainly claimed to be the world richest golden stupa of two thousand five hundred years old. The golden dome rises 98 meters above its base and is covered with 60 tons of pure gold along with numeric precious stones such as jade, ruby, sapphire and diamond including a 76 carat solid diamond on its top. Sightseeing in Bagan archaeological zone. Highlights; Gawdawpalin, one of the largest and most imposing Monument in Bagan, Shwegugyi temple of transitional in style between the early and late Bagan period, Thabyinnyu temple, the highest monument of universal science, Shwesandaw temple, for panoramic view of entire ruins, Dhammyangyi, unique of double Image of Buddha, Myingabar Gubyaukgyi , meaning “great painted cave temple” for its exquisite mural paintings, Myazedi pillar inscribed in four language mainly Myanmar, Mon, Pali and Pyu, Manhua temple with captive king’s impression of life imprisonment and Abeyadana temple famous for it’s fine mural paintings on Mahayana Buddhism. Visit one of the lacquer ware workshop to observe process of traditional Myanmar souvenir. Enjoy sunset from either newly built watch tower or one of the ruins. Breakfast at hotel and depart for Mt. Popa (45 km, approx 1 ½ hour). Mt. Popa, an extinct volcano with its shrine dedicated to animist spirits, known as “Nats”. On the way observe local daily life activities such as toddy palm juice extracting, sweet ball (brown sugar) making process and hand drill edible oil production etc. For the energetic, time to climb the 777 steps to the shrine at the top of the hill. Return to Bagan and continue visit some of the major ruins. Breakfast at hotel and transfer to airport for your Mandalay bound flight. Mandalay is the last kingdom as well as the center of the Myanma cultural, tradition, arts and crafts has long been known as a centre of skilled craftsmanship and in former times supplied the royal courts. Upon arrival at Mandalay airport meet and greet by Journeys representative and proceed to Mayan Chan jetty and board on a local fishermen boat for Mingun across Ayeyarwady river . Observe the world’s largest ringing bell casted by Bodawpaya in 1080 weighing 55555 viss which calculated equal to 90 tons and Mingun Pahtodawgyi, an enormous pile of bricks is all that remain of King Bodawpaya ambition to make it the world’s largest Buddhist stupa. After a visit of beautiful Mya Thein Tan Pagoda return to Mandalay and check in at hotel. Afternoon visit traditional handicraft making process such as wood carving, tapestry weaving, gold leaf hammering etc further visit to foot of Mandalay hill to observe “the largest book” at Kuthodaw Pagoda where entire Buddhist canon have been recorded on stone tablets totaling 729 in number. Shwenandaw “Golden Palace Monastery” ex-palace complex of former Myanmar kings, to observe finest Myanmar wooden architecture. Breakfast at hotel and visit Phayagyi to observe the most revered Mahamuni Image brought by Kind Bodawpaya in 1784 from Rakhine. The 4 meter seated Image was believed to have been casted in 1st century AD but over the year of offering gold leaf offering the figure is 15 cm thicket by gold. After a visit to stone carving, bronze casting and silk weaving process continue to ancient capital of Amapura “meaning city of immortality”. Visit Mahagandayon Monastery, home to several hundred of Buddhist novices and monks and observe the lunch process. Afternoon proceed to Sagaing, covered with 600 white-painted pagodas and monasteries, Sagaing hill is widely regarded as the religious centre of Myanmar and is home of 6000 monks and nun, 100 meditation centers. On your way visit traditional bronze casting, silver smith works which Sagaing is famous for. Sagaing become the capital of independence of Shan around 1315 after fall of Bagan. Visit Tilawkaguru cave temple filled with impressive mural painting date back from 1672, Umin Thounzeh cave temple with multitude of seated Buddha statues and Kaungmudaw Paya, further west towards Monywar is enormous white dome rise 64 meter. Enjoy fantastic sunset view from the 200 year old U Bein teak bridge span across Thaungthaman Lake at the time when Amarapura was Royal capital. Return to Mandalay. Today you are transferred to Mandalay Airport to board flight for Heho. Upon arrival in Heho Airport you are met and transferred to Inle Lake (approx 2 hour). Upon arrival at Nyaung Shwe board on a traditional long and tall motorized boat for a sightseeing tour of the lake. Traveling on the lake is an exhilarating experience for nature lovers and a chance to observe the unique traditions of the Intha people. Wonder unique leg rowing fishermen, floating firms, houses and monasteries on the stilt etc. Visit Nampam market which schedules on shore to be held here to day. Continue visit floating village of Ywama, the lake’s downtown and largest village on the Inlay Lake, 11 century Phaungdaw Oo pagoda housing five sacred Buddha Images, the weaving village of Inpawkhon, famous for traditional silk-weaving, Se Gaung Village, famous for the blacksmith work and Nan Pan Village with cheroot making and boat-building dockyards etc and end your day with a visit famous Ngaphechaung, a museum like monastery where old belongings of many monasteries are restored. Overnight Stay at the Hotel in Inle.